1. Our new build project in Corvallis is coming together! It's fun seeing new things installed every week. 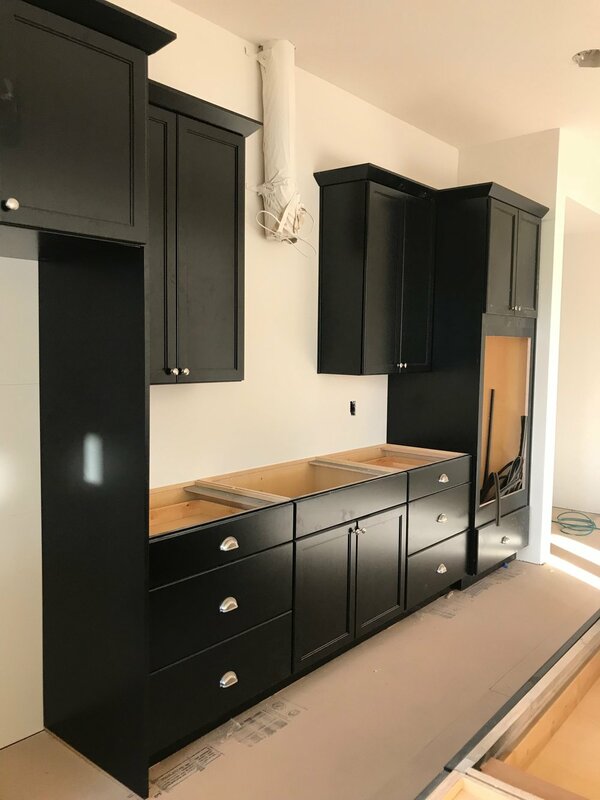 This week, they install cabinets (isn't this black pretty?). It's a timeless twist on white cabinets. 2. This weather just keeps getting chillier and chillier! I went out to my car this week, loaded all the kids in, and had to wait in the driveway for the windows to thaw. I think it's time to clean out our garage so we can park in it! Speaking of colder weather, I always have a scarf in my bag this time of year. Here are a few of my favorites (1, 2, 3, 4, 5). 3. It's Friday! This weekend is extra special, because Brad and I are getting away for our birthdays. Pearl District, here we come! Here are a few clothing essentials in my suitcase: rain jacket (black)(because the forecast says 100% chance of rain), Nikes (black), white tee, workout pants, beanie, jeans, boots (brown), sweater, earrings, and dress (for a fancy dinner). We can't wait to get away! 4. Both Aymee and I are conscious of what we eat (well, we try to be). Aymee just finished the Whole 30, and my family has a lot of food allergies (I have celiac which makes me gluten free, and Krew has a peanut, hazelnut, and egg allergy). As you can imagine, the holidays can be a stressful time since there's so many get togethers and parties with food at them. Thankfully, there is this AMAZING cookbook that has saved my families life during the holidays. It's called "Celebrations" by Danielle Walker. Have you heard of it? Danielle has also written two other cookbooks that our family uses for daily recipes (1, 2). If you are hosting anyone with food allergies, or if you know someone who could use a cookbook like this, I highly recommend any of Danielle Walkers! 5. Ready or not, we are welcoming our third baby late spring! We are overjoyed and grateful.